Thailand is an amazing tourist destination in South East Asia with lots of beautiful places and a variety of landscapes. But often we have known Thailand through its 3 happening cities with lovely beaches and night-life – Bangkok, Krabi and Pattaya. I am sure most of you are unaware about the beauty of other places in Thailand. We are the fortunate ones who got an opportunity to explore an offbeat destination in Thailand – Chiang Mai through a FAM trip organised by TAT, New Delhi. There are many places to explore in and around Chiang Mai, and one such place is the Bor Sang Umbrella Centre. Situated at a distance of 8km south east from Chiang Mai along the San Kamphaeng Road, this village is famous for handmade paper umbrellas, cocktail umbrellas, lamps, fans and parasols. At the entrance of these handicraft centre the colourful paper umbrellas of all hues and colours which are hung from the top, gives a very vibrant look to the place. The genesis of this craft in Bor Sang is not very clear but the local people believe that a monk who had stopped by to practice meditation in the village had introduced this craft to the villagers there. During the ancient era, villagers would curate these umbrellas during non-harvest seasons. Various umbrella parts would be fashioned out of natural products – bamboo strips for the ribs, soft wood for the cap and handle, natural latex for the varnish and sa paper for the ‘sail’. All the patterns were drawn using natural colours derived from tree barks and plants. Now acrylic paint is used more often. Popular for exceptional handicraft quality as well as distinctive floral designs, Bor Sang Umbrella Village has etched its name everywhere within the country as well as abroad. 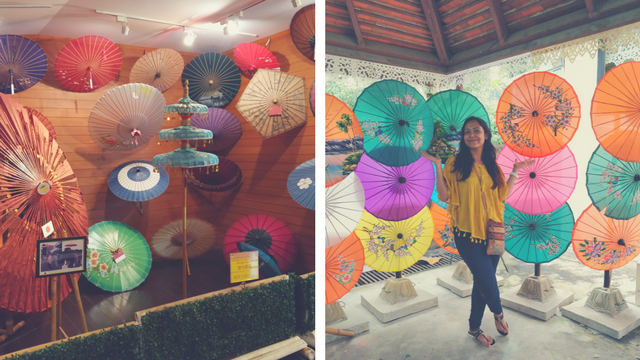 This village has become almost identical with the paper-umbrella craft itself and thereby has eventually grew up to be the cultural emblem of Chiang Mai. The umbrella centre is structured in such an assembly-line set up that a visitor can witness the complete process of making an umbrella right from the beginning till the end as the artisans work on the same. All products are made from Sa paper obtained from the bark of the mulberry tree or more recently cotton. The designs which mostly has floral motifs and patterns depicts the rural scenery of Chiang Mai. However the designs are changing now and there could be seen glimpse of abstract patterns as well in these products of handicrafts. The artists in this handicraft centre is very skilled in decorating the umbrellas and fans with different designs. They also willingly embellish with attractive designs the other items like purse, mobile covers, hat, jacket etc. which the visitors get along with them. In that handicraft centre the visitors can also learn to paint and decorate those beautiful pieces of handicrafts. There is a huge shop in the Bor Sang Umbrella Centre which sells a large variety of intricately painted umbrellas and parasols along with other locally made handicraft products from where tourists can buy souvenirs for their loved ones. The best part of this lovely excursion was, the opportunity that we got to paint and play with some colours on small umbrellas. Everyone from the group of seven ladies, just loved this colourful activity as it brought out the creative side of each one of us. Every Year during the third Friday of January the Annual Bor Sang Umbrella Festival is held, when the entire village along with the San Kampaeng district comes to life with festivities and vibrancy through exhibitions and colourful parades. If You are in Bor Sang then you can never come out of this lovely handicraft centre without purchasing this wonderful pieces of art and keeping it as a memory from Thailand at your home.